Link to Google Maps for directions. Please note it takes approximately 100 minutes to drive to Lake Arrowhead from Arlington, VA. Turn left on Main St. for 0.6 miles to traffic light on Reservoir Avenue. Turn right on Reservoir Avenue and go 2.6 miles (Reservoir will turn into Fairview Road) to a stop sign. Turn right onto Brookstone Road then almost immediate left onto Valleyburg Road. Go 1.3 miles to the Lake Arrowhead entrance on the left. (Note: Valleyburg Road will turn to the right prior to the Lake entrance – keep going straight on Lake Arrowhead Road). There are signs along the way for Lake Arrowhead beginning on the turn from Reservoir Rd. Take exit 13 to Rte 55 West towards Front Royal until it dead ends. Take a left at the light onto 340 South for approximately 30 miles to intersection of 340 / Business 211 (Main St.) in downtown Luray. Follow directions from downtown Luray above. Take 211 West through Sperryville over Skyline Drive towards Luray. Turn left on Business 211 to downtown Luray for 0.9 miles then left on Dry Run Rd. Follow Dry Run Rd for approximately 3.7 miles until it dead ends at Lake Arrowhead Rd. Make a right on Lake Arrowhead Rd then go approximately 1.6 miles. Park will be on your right. Take 211 East towards Luray then right on Business 211 East towards downtown Luray. 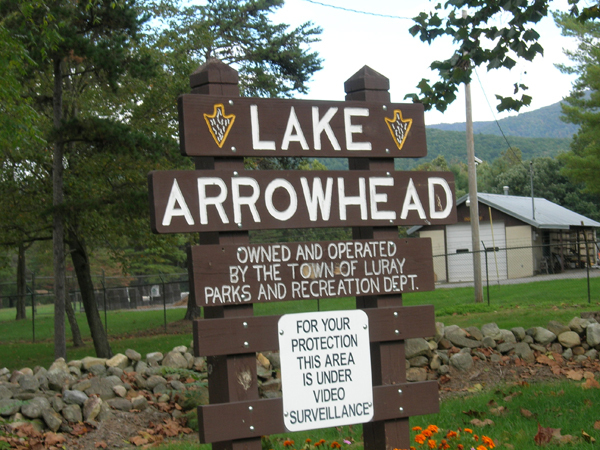 Follow directions to Lake Arrowhead from downtown Luray above.